HPC-optimized clouds provide access to flexible and elastic scientific and technical computing to solve complex problems and drive innovation. You can find bellow the slides of my keynote at EGI-TF 2013 where I described the most demanded features for building HPC and science clouds, and illustrated using real-life case studies from leading research and industry organizations how OpenNebula effectively addresses these challenges of cloud usage, scheduling, security, networking and storage. The keynote ended with a view of private cloud's future in HPC and science, and grid as the foundation of cloud federation. "Key Challenges in Cloud Computing: Enabling the Future Internet of Services" is the title of our last article published in the August 2013 issue of the IEEE Internet Computing Magazine that describes how Cloud computing will play a major role in the future Internet of Services, enabling on-demand provisioning of applications, platforms, and computing infrastructures. The article describes the several technology challenges that must be addressed to turn this vision into reality. Specific issues relate to deploying future infrastructure-as-a-service clouds and include efficiently managing such clouds to deliver scalable and elastic service platforms on demand, developing cloud aggregation architectures and technologies that let cloud providers collaborate and interoperate, and improving cloud infrastructures' security, reliability, and energy efficiency. We have just published a post at the OpenNebula blog with our view about the different measures that should be considered to evaluate the openness of the main open-source Cloud Management Platforms (CMPs). Which is the most important measure of openness in cloud computing? Do the cloud users really care about this? Users mainly want a solution that meets their functional needs, and are interested in open-source as a way to enhance flexibility, lower costs and avoid lock-in. However, as discussed in the post, most of these benefits are only available when an open-source software can be used in production environments without the addition of proprietary components. 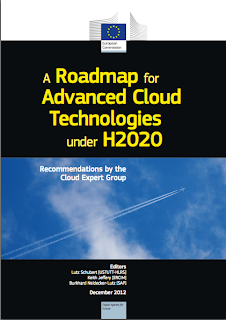 This is the title of the last report prepared by the EC Cloud Expert Group that proposes a concrete roadmap to help Europe overcome existing technological challenges and reach a key position in the global Cloud market. The previous reports on Advances in Clouds - Research in Future Cloud Computing evaluated the state-of-the-art and developed future research directions in cloud computing. This report is the main result of our last meeting in October 2012 to analyze the expected market development in which Europe can participate and which technological challenges will have to be faced in order to reach these scenarios. So, enjoy the report. I think it is a must-read for people defining Cloud Computing strategies, developing innovative research lines, or exploring emerging market opportunities beyond today’s Clouds. 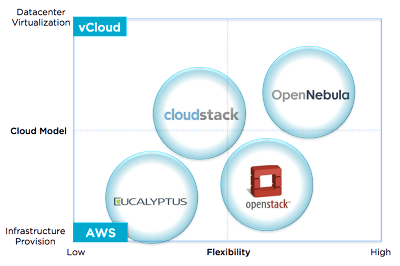 We have just published at the OpenNebula blog our experience about the different types of cloud models, from datacenter virtualization to infrastructure provision, and about how the main open-source Cloud Management Platforms (CMPs) are targeting their needs. 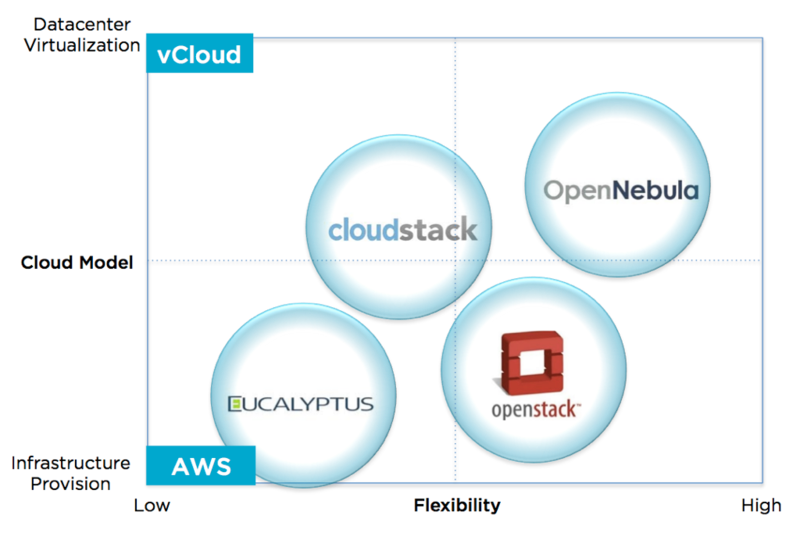 The post introduces the CMP Quadrant, a tool aimed at aiding corporations to better understand the present and future landscape of the cloud market. I think it would be best for everyone from these open source projects to figure out how we can work together to better serve our users. 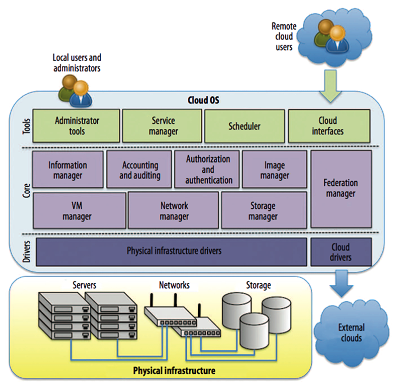 "IaaS Cloud Architecture: From Virtualized Datacenters to Federated Cloud Infrastructures" is the title of our last article published in the December 2012 issue of the IEEE Computer Magazine that presents an architecture reference model for IaaS clouds. The article introduces the cloud OS (Operating System) platform as the core component of this architecture that is responsible for managing the physical and virtual infrastructure, orchestrating and commanding service provisioning and deployment, and providing federation capabilities for accessing and deploying virtual resources in remote cloud infrastructures. 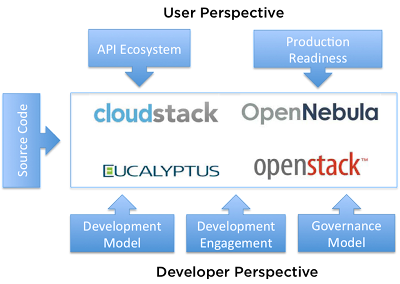 The article ends with a description of different architectures for cloud federation. OpenNebula is also mentioned as an open-source reference implementation of the cloud OS platform.